Academy Award and Golden Globe nominee Lee Daniels – creator and executive producer of broadcast’s No. 1 series, EMPIRE – partners with Tom Donaghy (“The Whole Truth”) to pull back the curtain on music’s gritty and dark reality in STAR. Featuring a soundtrack of original music and stunning music performances, STAR is an emotionally powerful drama that follows three talented singers – running from their pasts and desperate for a new start – with ambitions of stardom, as they navigate the cut-throat music business. But reality soon dawns on the girls’ fantasies, and they start to learn that ambition often comes at a cost. Meet STAR (newcomer Jude Demorest), a tough-as-nails young woman, who came up in the foster care system and decides one day to take control of her destiny. 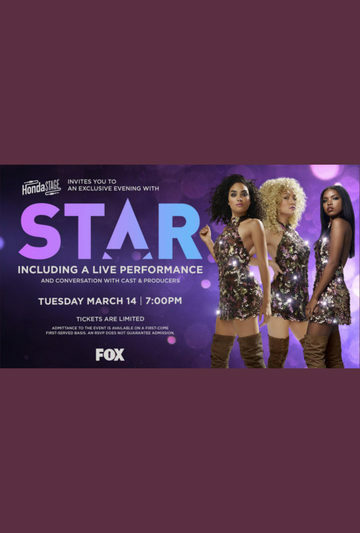 Star tracks down her sister, SIMONE (newcomer Brittany O’Grady), and her Instagram bestie, ALEXANDRA (newcomer Ryan Destiny), and together, the trio journeys to Atlanta with the hope of becoming music superstars.